There is no straight way to delete your Facebook account permanently, if you think its enough and don?t want to use Facebook anymore. One way to deactivate your Facebook account is from Deactivate Account section from Account Section. This makes your account inaccessible to other Facebook users. But it is just like logging off. Once you log into account, it is once again accessible like nothing has happened. At some point you would like to delete your account permanently for whatever may be the reason. If you need to deactivate permanently you have to search Facebook help for delete Facebook. Help can be accessed by the help text located at the footer of the Facebook page. There you will see submit your request here. From that link you can deactivate your Facebook account permanently. I guess it will give 15 days time until you log on to restore your account. If you don?t it will be deleted permanently. Most of the programs that you install in your computer creates a shortcut at your desktop. I install whole lots of programs and there are whole lot of program icon that sits up at my desktop. The only problem with the icons is its beauty is destroyed with the windows overlay of the arrow to show that it?s a shortcut. So I searched the internet for if I could delete that arrow that pops on my icon. I found some registry tweaks for it but I opted a small software that deleted the arrows from my icon. Now my icons at my desktop looks great without the shortcut arrow. 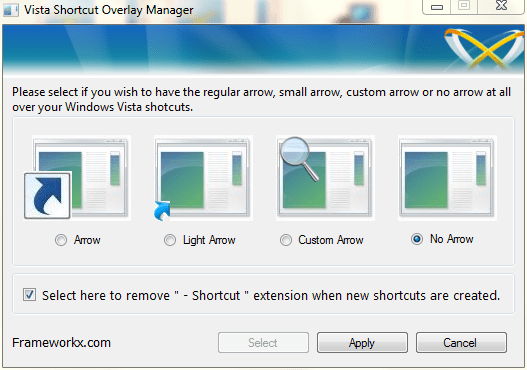 If you are willing to delete the arrow from your icon then I recommend you to use this software. Download the software from this mediafire link. 4. Select no arrow if you want to remove the arrow. *Note: If you want to download the file from the original source of the article you need to install the program in order to use the program. If you download from my mediafire link you do not need to install the program just extract it and use it. Also my operating system is a 32 bit. Don’t know if this program works for the 64 bit Operating system. New year wishes to all. 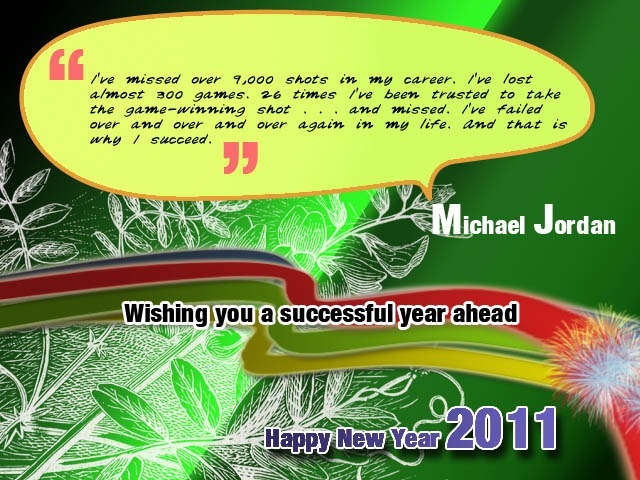 Wish for a fruitful year ahead. If you are a Movie freak and you like to download and watch movie in high quality then this is really interesting for you. There are movies that are released and you don’t know whether it has been released in DVD or B-ray. The only way to find if the movie is been released in dvd is to Google search or see its releases in Wikipedia or imdb etc. Buts this takes lots of time and it also means that you have to frequently check the site for if it has been released in dvd. What if you don’t need to check for it. Wouldn’t it be great to find out instantly when the movie is available in DVD or B-ray. Then here’s the tip. Go to http://www.amazon.com create a free account. Search for the movie you want in movie section. In amazon there are movies that are listed in coming soon section. 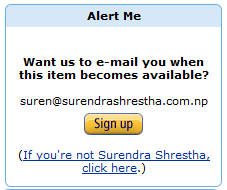 In Amazon you are told ?Sign up to be notified when this item becomes available.? for the coming soon items. Click on the sign up and you are done. The amazon will mail you about the DVD or B-ray Release of the movie as soon as it is available. Now you can either go to shop to find your copy if you like to purchase. For others you can search its dvd rip or b-ray rip of the movie in torrent or other file hosting sites?. One of the problems that user are facing these days are having the single partition on your laptops. These days laptop come with only one drive with whole lot of space and (maybe)one with the backup partition containing recovery data to restore the laptop to its factory setting with all drivers (sometimes hidden). One way to create the partition would be to install the operating system again and create the partition then. But that would not be a sensible way to do it because it takes whole lot of time to do it and installing the OS means you need to install all the software and drivers that came along with your Laptop (preinstalled during the time of purchase) and in some cases drivers are hard to find. Does that mean you are stuck with only one drive? No definitely not. There are others ways around. You can partition your drive into multiple drives without the risk of data loss. You can create multiple partition in windows 7 or vista based OS with inbuilt partition manager. All you have to do is type ?diskmgmt.msc? on the run window( type windows + r to open run). Right Click on your system partition and click Shrink Volume. Now shrink volume to your desired size. After you shrink the volume there will be unallocated space. 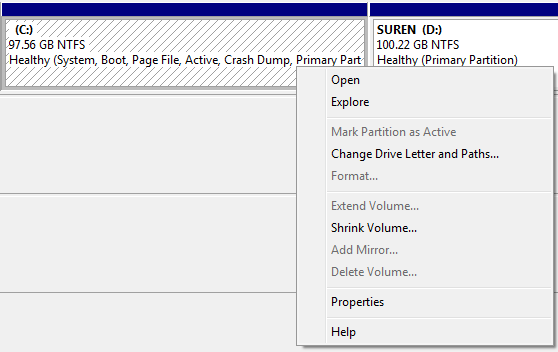 Now right click that unallocated partition and select create new volume. Now you can create different size drives on your laptop. The above procedure is for those who don?t want to use or install other software. But if you don?t mind installing other program to create partition( I recommend installing third party software because of the availability of other many functions i.e changing partition from fat to ntfs and so on) you can install a handy and free partition tool called Partition Wizard . This has more features than windows disk management utility and the great thing is its home edition is free to use. Support Windows 2000/XP/Vista/windows 7 (32 bit & 64 bit) operating system. Extend system partition to maximize computer performance. Manage the hard disk for substantial performance increase. Create, Delete and Format partitions with simple steps. Disk Copy to protect or transfer data. Support disk and partition size larger than 2 TB. Convert partition format from FAT to NTFS. Partition Copy: Copy the entire content of one hard disk to another. Copy Disk Wizard: Copy the entire hard disk to another without having to reinstall Windows. Disk Map – Visually demonstrate your disk/partition configuration; preview the changes before applying. Hide/unhide partition, set active partition, etc. – Change partition properties easily. Hot Extend Partition without reboot. You can download and try it to create as many partition as you want. Make sure you read the warnings, documentation, help carefully before proceeding. Partitioning your hard disk is a serious task and may lead to loss of data when not used or done properly. Better to make copies of V.V.V important documents before proceeding. Also keep in mind to keep your laptop or pc in continuous power supply the process once begun cannot be halted at the middle and causes the drive to loose data if there is a power failure at the process.